a play based on The New Westminster Frasers Baseball Club will be presented Sunday June 12 at Douglas College Theatre. "Burning The Infield" will be presented by City Stage New West (http://www.citystagenewwest.org/) , There will be artist Jennifer Ettinger, silent auction itesm such as Delta' Jeff Francis a pitcher with Kansas City Royals. April 2 and May 7 will see authors Ken McIntosh and Rod Drown at the River Market (the old Quay in New Westminster) between 11AM and 3PM signing thier book "The New Westminster Frasers Baseball Club". 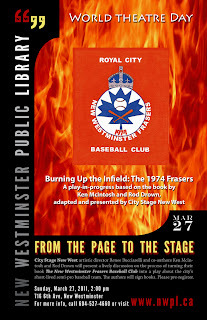 World Theatre Day March 27 at 2PM New Westminster Public Library parts of the play "Burning The Infield" meet the book authors Ken McIntosh and Rod Drown and get a signed copy of the book The New Westminster Frasers from which the play was adapted. 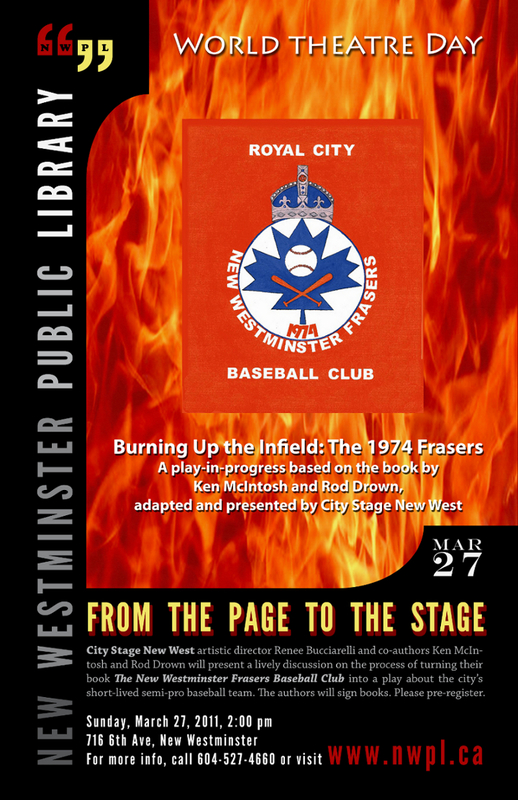 Full play at the Douglas College Theatre present by City Stage New West on June 12th also get a signed copy of the book The New Westminster Frasers for only $19.95 in which the play "Burning the Infield" has been adapted. New Westminster Frasers book is for sale now $19.95 Cdn with the US price fluctuating. Contact blackrat09@gmail.com for a book or for locals there are book ings July 18 at Renaissance Books unit blk 6th Street and August 1 at Village Coffee Lounge on 12th Street. Newe Westminster Museum 302 Royal and the Arts Council in Quuens Park. My frustration continues first the printer had a fire in the electrical room and got me 25 books last Friday. The 1000 books owed are at the bindery where there has been a problem and 100 were to be ready today. Now I must wait till Tuesday for the full order as the 100 were cancelled today incorectly. I am to receive a discount but that does not get me the books to say the least I am upset. The New Westminster Frasers book is for sale $19.95 Canadian.